The Ricoh Aficio SP6330N is a fast, quiet and reliable device with a small footprint and a number of features suited to small businesses and home offices. It outputs at an impressive 35 pages per minute in monochrome and supports a range of media sizes. The SP6330N is ideal for users who require a printer for medium to large workloads of black and white, text-heavy documents. The Ricoh Aficio SP6330N’s compact form measures just 18.8 x 17.2 x 15.9 inches, and it weighs just over 22 kg, which makes it relatively easy to pick up and carry around a small office. The printer is powered by a 466 MHz processor and 256MB of RAM, though the latter can be upgraded to a maximum of 512MB. There are two interfaces, USB and LAN, a maximum media capacity of 1,600 sheets and an output tray capacity of 500 sheets. The maximum printing speed of 35 pages per minute is relatively quick, and the first printout comes in at less than seven seconds. The wired connections are capable of supporting the needs of modern enterprises, while the laser tech produces sharp and consistent levels of text quality at a maximum resolution of 1200 dpi. 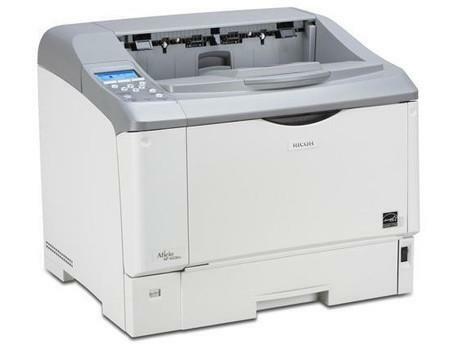 The Ricoh Aficio SP6330N also meets environmental standards with its ENERGY STAR certification. The maximum media capacity should be sufficient for most media requirements. It also delivers a competitive cost per page. The Ricoh Aficio SP6630N prints in black and white only, and both its weak processor and low memory mean that it won’t be able to output graphic-intensive prints, though the standard monochrome is already a limiting factor in this regard. There are no wireless options for mobile printing, and the device is prone to jamming. The printer does not have any scan or copy functionality.